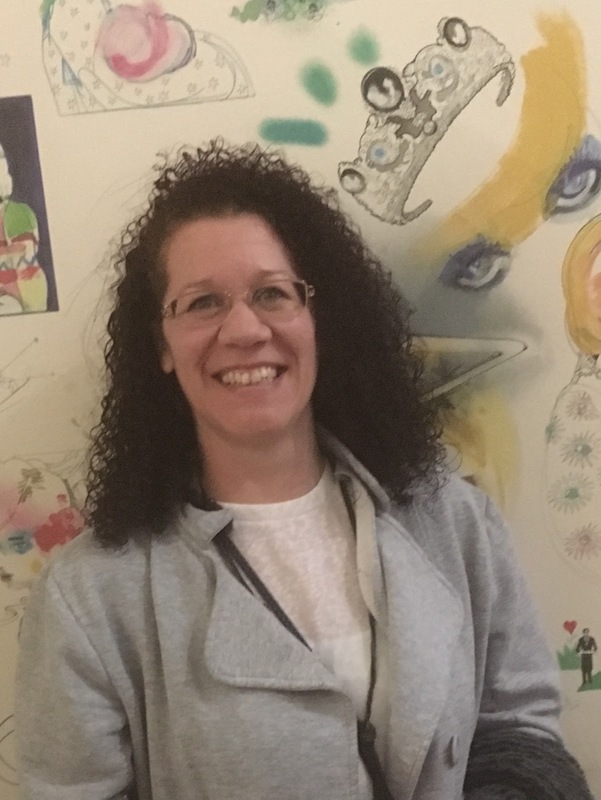 Author Cristelle Comby is back for a visit. We’re chatting about her new urban fantasy mystery, Hostile Takeover (Vale Investigation, book 1). During her virtual book tour, Cristelle will be awarding a $20 Amazon or Barnes and Noble (winner’s choice) gift card to a lucky randomly drawn winner. To be entered for a chance to win, use the form below. To increase your chances of winning, feel free to visit her other tour stops and enter there, too. Welcome back to Reviews and Interviews, Cristelle. 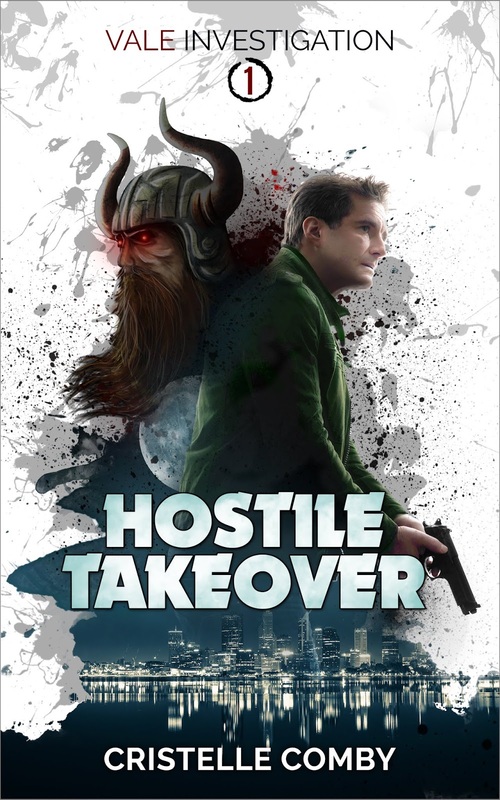 Hostile Takeover is the first book in a new series of Urban Fantasy mysteries I’m working on. It’s set in the fictitious metropolis of Cold City, USA. The main character, Bellamy Vale, is a former US Marine turned Private Investigator. A couple years ago, desperate and at an all-time low, Vale signed a compact with Death in exchange for a favor. Now he’s on Her payroll and acts as Her envoy on Earth… and the only reason he’s employee of the month is that no-one else was foolish enough to take the job. The main idea was to set the story in a world where every mythology you’ve ever heard of exists. Not everyone knows it, but there are hundreds of different mythologies on our planet. Sure, we all know the big ones like Roman, Norse and Celtic, but there are so many more. And each one’s filled with its own monsters and legends. It’s a fascinating subject. I ripped the yellow tape away and entered the arcade. My nose was assaulted by a mixture of bleach and cleaning products. The cleaning team must have worked through the night. It wouldn’t do for the neighbors to wake up to someone lying dead on their sidewalk. No amount of bleach was going to get rid of those bloodstains, though. And it was going to take a lot more than soap to repair the cuts in the carpet and the claw marks on the concrete walls. My stomach churned at the sight. Either that or it was protesting against all the painkillers I’d popped down. I heaved a sigh, knowing the next step was going to make that feel like a paper cut in comparison. Closing my eyes, I forced my breathing to slow down and emptied my mind of everything superficial. I counted down from five to one, opened my eyes, and looked at the scene in front of me again. The world had narrowed down, dimmed to a tunnel of sharp, laser-like focus, allowing me to make out the individual fibers of carpet even. The smells had multiplied into a rich palette of chemical compounds that I could separate and identify. Knowing I couldn’t keep my concentration up like this for too long, I hastened to get to work, taking in all the tiniest details of the crime scene. From the intensity of the claw marks and the pattern left by the blood splatter, I could map out the attack to the point of being able to discern the moves of the victim from those of the beast. Whatever it was that had made the attack, it had a cruel streak that would have done credit to Jack the Ripper. It had trapped the victim in a corner, pushed him further and further inside as it kept moving forward, claws digging into the carpet like some low-rent Hellraiser knock-off, ready to strike when the fear hit fever pitch. Sweat and fear permeated the air around the place where the old man had stood, trembling and facing a voracious, tall monster. In one giant leap, the beast was on him, claws fully extended and shredding flesh into beef strips. I recoiled at the thought then shook myself out of it. Despite the cold air, I’d broken into an even colder sweat. The world was spinning around me. I walked back to the street, desperate to get fresh air that didn’t reek of death. I was shaking as I fought to suppress the dry heaving of my stomach. There would be no need to revisit the scene. Everything I’d seen of that massacre was deeply etched into my mind. I’m almost done with the second book in the series, and percolating ideas for the third. I tried to stay true to the legends, while making it work in a contemporary setting. So I had to update some of the Gods and monsters. I asked myself what they would they be like today; how they would behave. It was challenging and fun at the same time. For this book, a lot of the research was mythology-related. Seeing as it’s a subject I’m passionate about, it was no chore for me. I do all the research beforehand, while I write the book’s outline. Outlining is a pivotal part of my method that takes me several months. I sketch out all the major plot points up to and including the ending. I only start writing when I have everything figured out; it allows me to avoid things like writer’s block, and unfinished manuscript. I write on a laptop so I’m flexible with locations. I usually write from home, but I don’t have a fixed spot. What matters the most is that the room is quiet, so I can loose myself within my thoughts. My all-time favorite is Jim Butcher. Other than that, it’s a mix of crimes, fantasy and science-fiction. At the moment, I’m reading the second Repairman Jack novel, by F. Paul Wilson. I have some free prequel novellas that you can get on my website. There’s one for Vale Investigation that showcases Vale and Death’s first encounter. And another one for my Neve & Egan Cases series (cozy mysteries set in modern-day London). Novelist Linda Nielsen joins me today to chat about her new humorous romantic suspense, Because I’m Worth It. Welcome, Linda. Please tell us a little bit about yourself. My characters have been influenced by years of work and play. I'm now retired and live on top of a mountain in the Sierra Foothills with my husband and seven furry critters. Because I’m Worth it is a fictional, multi-generational saga that will have you laughing out loud with the idea of a proposed marriage of convenience. The silly, but obnoxious character of Terri Sue Ellen Covington, an alcoholic southern belle, who is the mother-in-law-to-be, uses her annoying, but hilarious mannerisms in an attempt to control two families. Polar opposites meet when Skye Topple’s Big Sur relatives, a group of people who enjoy a creative and meaningful life style, try to understand his obsession for wealth and his choice of Delaney Covington for his bride-to-be. With witty dialogue and a hefty dose of humor the characters engage each other on many levels, setting free a roller coaster of emotions. A secret emerges changing everyone’s life so that a baby’s future, a grandmother’s love and a man’s career hang in the balance. How far will people go to get what they want? Inspiration came from years of interactions with folks in all walks of life. Let’s face it, people have some unusual notions. It’s part of what makes life interesting. I usually have a new example every week that I can share. In the grocery store parking lot, I saw a woman carefully beep the locks on her car but leave the windows down. Now the question was; do I tell her or not? I did and she thanked me and told me she had her keys in her purse and the windows were lowered to keep her car cool. I knew there was no more to be said. In Because I’m Worth It, I created several characters, introducing them as family members with different values. Some were up to the challenge; they actually jumped out in front, while others preferred the background. 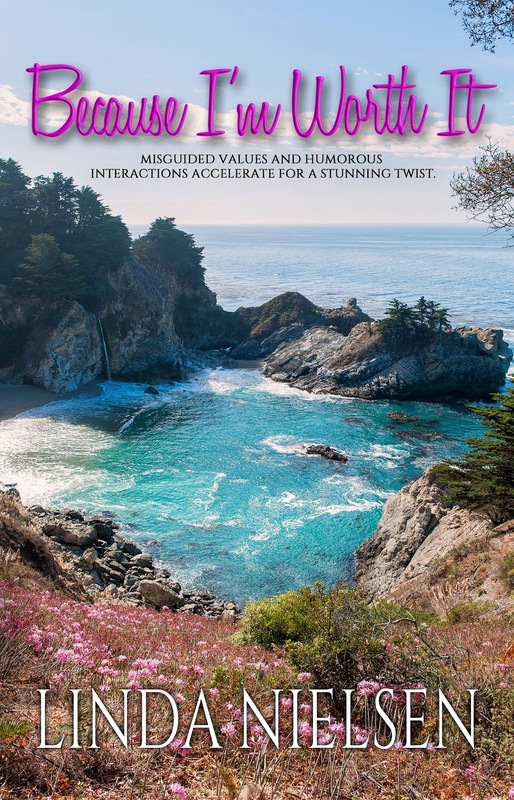 I originally had an experienced angel and a dysfunctional angel directing the two families in a humorous way on how to make better decisions with their lives but after the first draft, when I had associates read the work, it seemed that the families had enough personality quirks going on that they could hold their own. I decided to save the angels for another idea. I tried a couple more drafts where I turned the characters loose to see how they would behave. They were all over the pages and needed to be reined in. I added a story board to keep the plot on point and created separate outlines for each character’s traits. I’m a big fan of bullet points and stick ‘em notes for clear focus. With those tasks complete, I reorganized the story line and got back to work. Many, many drafts later I had a book that was fun and functional with families who would be remembered. The private jet taxied to the terminal. Charles breathed a sigh of relief when Terri Sue Ellen surrendered her drink. “It’s a house,” Charles replied patiently. Ruth appeared and bent over while Terry Sue Ellen sat down and pushed. “See there. Fit as a fiddle. Thank you so much, Lorraine.” She nodded at the young woman who looked up at her. There’s a possibility of a sequel that challenges the characters and their self-created dilemmas, inserts new dimensions and introduces fresh people who add positive impact to the future. My mother was a writer but kept it a secret. She wrote fanciful tales of faires in the garden who rode on butterflies and frogs who could sing country songs and cats who had tea parties. I recall how she would open a cardboard bound book and select a story to read. After she passed away, I found that book in a bottom drawer in her bedroom and realized the stories were in her own hand writing! I was astonished. She always encouraged me to write and I started in the 6th grade and have never stopped even though I had to get a “real” job to earn a living. I’ve always felt good telling a tale plus I find people to be fascinating. I do not write full time but, even when I’m engaged in other activities, I find that ideas pop up and I’m a big note taker. When I am writing a book, I am full time at the computer. When I’m promoting a book, well, that’s like a full time job. My computer is in the laundry room. One of my cats, I have several of them, will sit in a drawer next to me by the keyboard and I will talk out loud to him/her about dialog, ideas, cat nip mice, readers thoughts, cat treats, just about anything that comes to mind. My husband usually quietly closes the door so others can’t hear me. A dancer, a writer, an artist . . . I was open. One day I would want to live in the big city and run a company; the next I wanted to live on a farm and feed chickens. My parents encouraged everything so I felt no limits. But eventually life settled in around me and I got a job. It was dull so I moved to California and founded a company and met a man with shoulder length silver hair who had designed many homes in the area. My girlfriends held an intervention and told me he had a reputation for being fast with the ladies. I thought I hope so ‘cause I’m not getting any younger. After a few years we got married, semi-retired and moved to an old gold mining town in the Sierra Foothills. I hope my story will take you away from daily cares, allow you to experience the lives of other families, good and bad, serious and amusing and give you reason to laugh. Happy reading! Romance author Sofie Darling is here today to chat with me about her new historical romance, Tempted by the Viscount. During her virtual book tour, Sofie will be awarding a $25 Amazon or Barnes and Noble (winner’s choice) gift card to a lucky randomly drawn winner. To be entered for a chance to win, use the form below. To increase your chances of winning, feel free to visit her other tour stops and enter there, too! Welcome, Sofie. Please share a little bit about your current release. Tempted by the Viscount is the second book in my Shadows and Silk series. Jake is new in Town. He’s been a sailor all his life, but he recently inherited an English viscountcy that he didn’t really want. He has two goals: sort out the estate’s finances and find a wife. Well, mostly a stepmother for his daughter Mina. She has a mixed-race heritage and for her to succeed in English Society, she will need a proper stepmother of impeccable reputation to guide and protect her. With her pedigree, Lady Olivia Montfort might perfectly fit the bill, except she’s a scandalous divorcée and has sworn off men entirely. What she really wants is her own townhouse and complete independence. When Jake’s past in the Far East surfaces in London and threatens Mina’s future, Jake and Olivia must strike a bargain to help each other. What they don’t anticipate is the temptation of each other. I read a historical fiction novel set in early 19th century Dejima, Japan and was fascinated by the setting. Before 1854, Japan was closed to all Western trade with the exception of the Dutch and only on the small, man-made island of Dejima located in the Bay of Nagasaki. It wasn’t long before my half-Dutch, half-English sea captain came to me, and his story began to unfold. I love the setting so much that I’m planning on returning there in a later book in the series. I’ve just turned in the third book of the Shadows and Silk series, Her Midnight Sin, to my editor. It’s the story of world-weary Captain John Nylander and feisty widow Lady Calpurnia Radclyffe as they vie for the same Devon country estate. There will be pirates and apple brandy. Honestly, I still have trouble with that. My first book was published less than a year ago. I keep waiting for the feeling to kick in. I consider myself a part-time writer and full-time mom. A typical day for me begins with a pre-dawn run before I start the kid morning routine of packing the school lunch and seeing my youngest off to school. Then I write … until it’s time for school pick-up and after school routines. I can’t create on a computer. I have to handwrite on a blank sheet of typing paper with a #2 pencil, preferably a Ticonderoga. I was kind of a dreamy kid who was always reading. I never really thought about what I wanted to be. I think if someone had told I could’ve been a professional reader, I would have jumped on that. Thank you so much for having me on your blog today. I really enjoyed it! 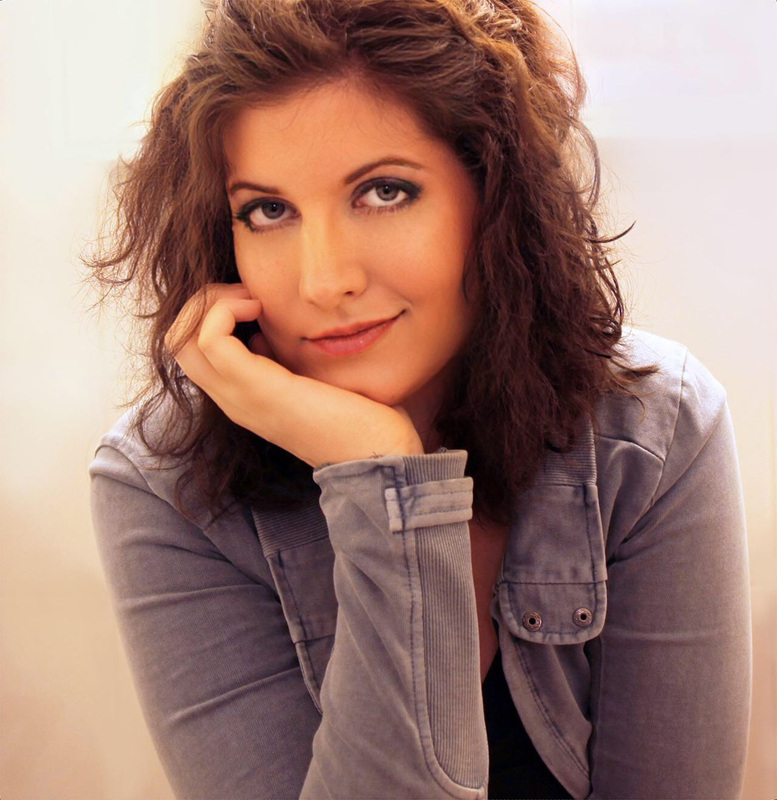 Novelist Rachel Brimble is back! Today we’re chatting about her new Edwardian romance/sage, The Mistress of Pennington’s. During her virtual book tour, Rachel will be awarding a $25 Amazon or Barnes and Noble (winner’s choice) gift card to a lucky randomly drawn winner. To be entered for a chance to win, use the form below. To increase your chances of winning, feel free to visit her other tour stops and enter there, too! 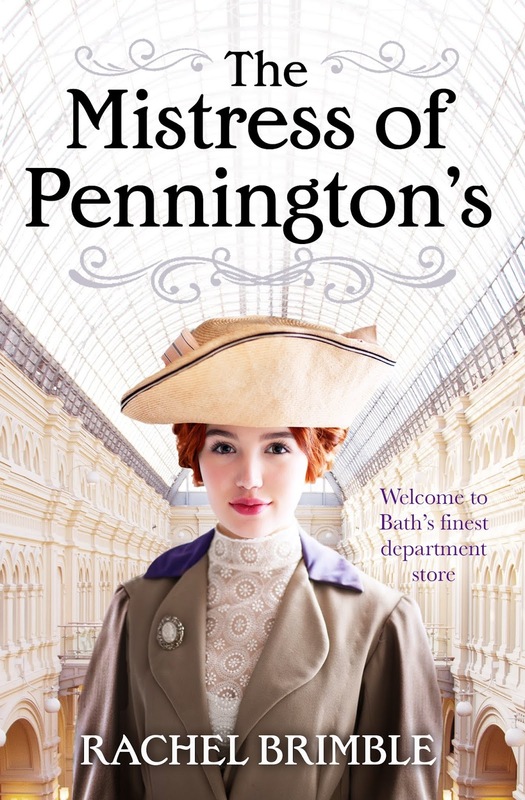 In January 2018, she signed a four-book deal with Aria Fiction for a brand new Edwardian series set in Bath’s finest department store. The first book is The Mistress of Pennington’s. Welcome back to Reviews and Interviews, Rachel. I loved the TV series The Paradise and Mr Selfridge, but something was missing for me. I soon realised I wanted more focus on the female characters and the women’s issues of the day. I struggled for a long time wondering whether writing a book in a department store was the right thing to do but when Aria Fiction offered me a four-book deal on the basis of The Mistress Of Pennington’s, I was convinced my instinct to write a series was right! I am waiting for edits for Pennington book 2 (The Suffragette At Pennington’s releases Jan 2019) and also writing the first draft of Pennington’s book 3. I’ve also plotted a brand new contemporary romantic suspense which I hope to get started on within the next month or so. Busy, busy! My biggest challenge is always ensuring the plot idea I have is strong enough to stretch to 90,000 words! I plan my books rather than just write by the seat of my pants but every book I write seems to come to a screeching stop around the 50,000 word mark and I have to figure out what’s missing. So far, I’ve managed to find it…often with the help of my critique partners! Writing is hard and, unfortunately, doesn’t seem to get any easier. A bit of both – before I start a book I read a lot about the period and issue I want to explore, if historical or the issue if I’m writing contemporary. I tend to plot quite a bit before I start writing but once I start, I write the first draft from beginning to end without looking back. If anything needs researching pops up during that first draft, I’ll make a note and push on. For me, moving forward is the best way to ensure a book is finished. I am lucky enough to have a home office with a huge antique white desk and bookshelves as well as two corkboards in front of me for all my story ‘visuals’. As I live in the UK, I am more or less in my office every day because of the weather but, in the summer months, there is nothing I love more than taking my laptop into the garden. So many! But my favourites are Nora Roberts and Jill Shalvis for contemporary and Philippa Gregory and Alex Grecian for historical. I read a lot of non-fiction historical stuff, too. Especially biographies of past British kings and queens. Just to thank everyone who buys my books and has followed me on my journey – I appreciate every one of you! Oh, and my next release is Pennington’s book 2 – The Suffragette At Pennington’s is due for release in January 2019. 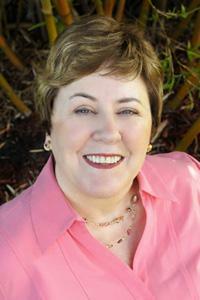 Novelist Bobbi Smith joins me today to chat about her new historical romance, Forbidden Fires. During her virtual book tour, Bobbi will be awarding a $10 Amazon or Barnes and Noble (winner’s choice) gift card. To be entered for a chance to win, use the form below. To increase your chances of winning, feel free to visit her other tour stops and enter there, too. The foreign rights to Ms. Smith’s books have been sold to China, France, Germany, India, Israel, Italy, Russia and Sweden. Smith’s current publisher is Amazon. 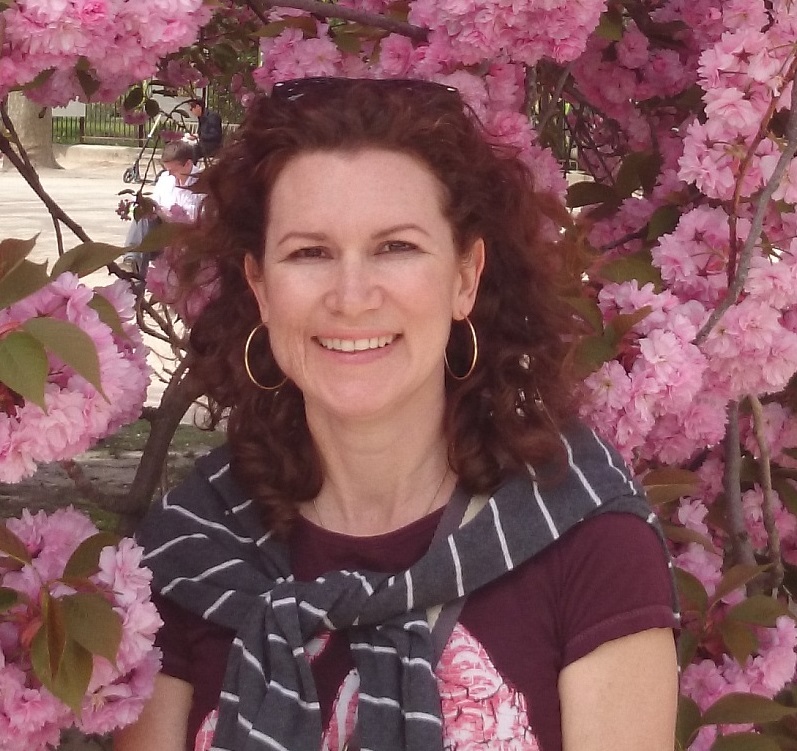 Bobbi has written two faith-based contemporary novels – Haven and Miracles – using the pseudonym of Julie Marshall. Welcome, Bobbi. Please tell us about your current release. When I was young, my parents took me to a river museum where I learned about the steamboat Sultana. It was a steamer carrying Union Soldiers home at the end of the Civil War. The soldiers had just been released from Southern prison camps and were marched to Vicksburg, Mississippi where they were loaded onto the Sultana. The Sultana was only supposed to carry 400 passengers and crew. When it left Vicksburg, it had more than 2,000 people onboard. It only made it to West Memphis, Arkansas before the boilers exploded. I believe it was the greatest maritime disaster of all time, and the memory of it stayed with me all those years and inspired Forbidden Fires, my second book. I wrote full-time for almost thirty years. It’s been a great career. Back in the 80s, I was blessed to be able to stay home and work while my kids were young. My most creative times are early morning and evening, so I was at the computer no later than 8 a.m. every day and usually there until 11 at night. I fell in love with women’s history during the course of my career. There were so many adventurous women out there we never learned about in history class, so I started my ‘Women Ahead of Their Times’ series. My books with ‘Lady’ in the title feature a heroine who isn’t afraid to take on a challenge – and a fantastic hero! In Lady Deception, our heroine is a female bounty hunter who is a master of disguise. In Weston’s Lady, the heroine is in a Wild West Show. The heroine in Outlaw’s Lady is a judge, and in Half-Breed’s Lady our heroine is an artist. Thank you for joining me today, Bobbi. Thank you so much for having me on your blog site! I hope everyone enjoys my stories! Author Mike Nemeth is here today and we’re chatting about his new crime thriller, The Undiscovered Country. In addition to his two novels, Mike has published two nonfiction works about sports: 128 Billion to 1, why no one can predict the outcome of the NCAA Basketball Tournament; and Lies, Damned Lies and Statistics, why the selection committee always chooses the wrong teams to play the college football National Championship. He also wrote “The Missing Ingredient,” an article published in The New York Times that explained why college football rankings are always wrong. Welcome, Mike. Please tell us about your current release. 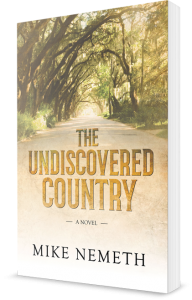 The Undiscovered Country is a southern family (dysfunctional) drama overlaid on a thriller/mystery plot with the mystery plot delivered upside down (or backward). There is a murder, but the characters (and readers) don’t know it happened until it is solved in the climax. Mystery writers compete with one another for ingenious methods of murder and in this case the “weapon” is unique in literature. What happens in the story: Three siblings gather at the bedside of their critically ill mother. The eldest, Randle, is the protagonist, and he’s relentless in uncovering the secrets surrounding his mother, his own identity, and his broader family. He unravels layers of mystery concerning his mother’s medical care, her estate, a wealthy man who claims to be his birth father, and plots to embezzle the wealthy man’s estate. These secrets lead to the biggest secret about the murder. What it’s about: The indignity of aging and dying, the need for a sense of identity, and what it means to be a southerner. My mother experienced a medical emergency similar to that of Randle’s mother. It was an agonizing experience that fortunately ended well. The situation provoked many heartbreaking, anger-inducing, and confusing episodes of behavior from various family members. It struck me that we do not do end-of-life well. As Shelby wiped a drop of water from Mom’s chin and I read the Wikipedia entry, an army of medical practitioners crowded into the room. Metzger, the cardiologist, led the invasion followed by Ms. Schmidt, who peeled off and leaned against the wall next to the door. Kaplan, looking sheepish, entered with a tall, bespectacled doctor I assumed to be Nieman, the ophthalmologist. Trailing behind was a fortyish doctor with patchy black hair. That had to be Rosenberg, the neurologist. At the last moment, Harrison, the immunologist, ducked in the door, completing the team. I glanced at Harrison. He shrugged. Metzger was fortunate I wasn’t holding a weapon. He saw my fury and held up a hand. “Sign the DNR, Mr. Marks. Save yourself the agony of life support and decisions about pulling the plug.” He gestured to Ms. Schmidt, who nodded. She had obviously organized this lynch party. I waited for my body to return to a normal temperature. The group probably thought I was considering Metzger’s recommendation. I was not. As the tallest person in the room, I had a perch from which to deliver my response. Harrison turned scarlet. The other doctors avoided eye contact. I think a writer is born a writer. It’s not a vocation one chooses; it’s an inbred compulsion to express thoughts and feelings. This was confirmed relatively late in my life with the publication of my first novel, Defiled. I do write every day, starting at 7:00am and continuing until I have a minimum of 1000 words or reach my target of 1500 words. However, once a writer is published, s/he becomes a small business person in the business of selling books and suddenly promotional work competes with writing time. I focus best amid chaos. Some of my best work has been produced on airplanes, at beaches, in hotel rooms and waiting rooms. As a substitute I plug in my headphones and listen to, and sing along with, rock-n-roll. My wife offered to ship me to a remote mountain cabin to concentrate, but I’m not sure that would work for me. It might be nice for her, though. A lawyer. Still do. My father thought I should be a politician since I lied so glibly and convincingly as a child. Now I lie on paper. I love interacting with readers and I’m thick-skinned, so I welcome all comments and suggestions. Thanks for joining me today, Mike.